Underneath the stir about Alinghi’s sails (country of origin?) there’s another drama percolating as Alinghi makes a move to require the challenger to moor inside Valencia’s Dársena between races. Why? I don’t have a statement from Alinghi, but I confidently infer it’s to assure public access to the excitement of America’s Cup 33—and because it would make life hard or perhaps impossible for the challenger. The wing that the BMW Oracle team plans to use, all 190 feet of it, comes with performance advantages and practical liabilities. In particular, it needs a lot of parking space. 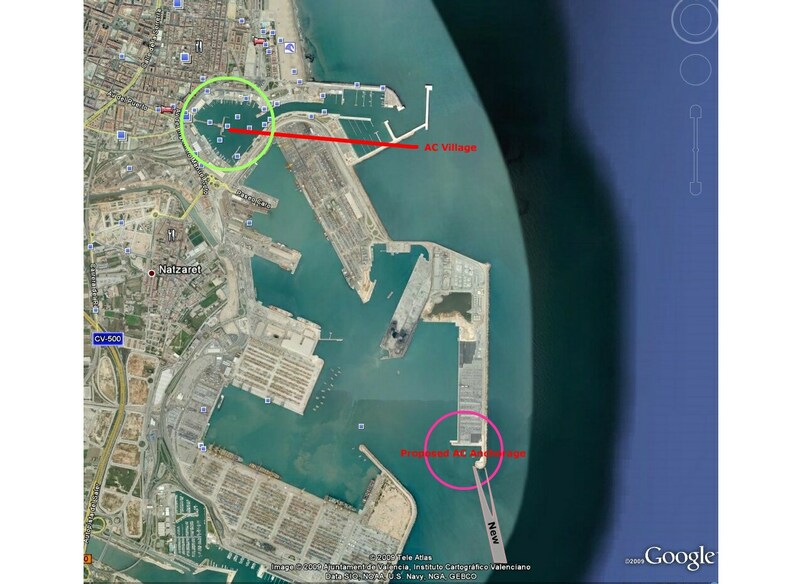 And the Dársena , the smaller of two adjoining harbors in Valencia, the one familiar from the 2007 match as America’s Cup Village, is tight for parking. But first there must be a jury. Nationality restrictions on sails came into the game in 1962, after the New York Yacht Club straw hats watched Gretel surge past Weatherly while flying a Ted Hood spinnaker in race two. Lacking mutual consent, and there’s been an infinite lack of mutual consent, methinks precedent opens the door to plenty of bickering in the six weeks remaining to the 33rd America’s Cup match. And given the likelihood that February in Valencia will bring us wind from the north—an offshore breeze—the 20-mile beat stipulated by the Deed of Gift for race one will take us a far piece toward Africa before we can even begin. I’m learning to love the smell of vitriol in the morning. Note: The trimaran and wing are presently aboard a ship that has cleared the Panama Canal and is making 18 knots toward Valencia and the harbor shown below. Click for an enlarged view of the disputed moorage areas, tat for tat for tat.